Should Jesus be in the picture? 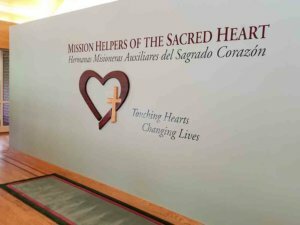 While volunteering at the Mission Helpers of the Sacred Heart center this week, I was snapping a photo of a sister for use in a newsletter I had designed for their Mission Advancement department. “Jesus should be everywhere,” she said. I thought how nice it is that the staff and community of sisters are able to work and live around religious icons all day, with access to several lovely and quiet chapels peppered off the hallways. Easy access to go kneel and toss up a few quick (or long) prayer flares as they’re going about their day. Cool, right? Such an environment could only affect a person’s spiritual mood. 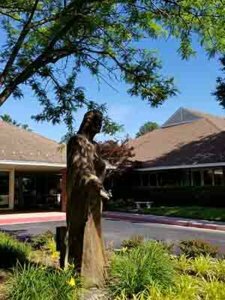 Jesus is definitely in the picture as the first one to greet visitors and residents at this Towson building on Chestnut Avenue, in the form of a hefty bronze statue in the Mission Helper Center’s circular driveway. One of his arms is outstretched, palm open; the other touches his “sacred heart.” It feels soothing – and reminds me who it is I am actually serving while there. The community’s slogan, “touching hearts … changing lives,” is inscribed on the welcoming wall in the lobby, and on promotional pieces and displays elsewhere. I wonder … if all employees everywhere, working at all types of companies, were surrounded daily by crucifixes, stained glass windows, altars, chapels, Blessed Mothers, and religious statues, would their work environment feel more peaceful, less hectic, contain fewer conflict, and be safer? You know – by adding Jesus to the picture. Although that will never be the situation on our planet, at least the sisters and staff at the Mission Helper Center can reap the benefits of their holy environment. It must be effective, too, because I often receive hugs as I arrive. Everyone is warm, friendly and calm. So yes, by all means, Jesus should be in the picture. 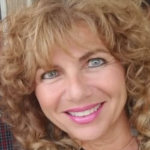 Suzanna Molino Singleton is a native Baltimorean and parishioner of St. Leo Church in Little Italy. A former staff correspondent for the Catholic Review, she launched her "Snippets of Faith" blog for the Catholic Review in June 2018. Suzanna is the creator of a weekly e-column, SNIPPETS Inspiration (since 2006), and the author of seven books, including Baltimore’s Little Italy: Heritage and History of The Neighborhood. Email Suzanna at 29angels@comcast.net.